I understand that nuts are filling because, in part, of their protein. Do nut milks (e.g., almond milk) possess similar properties? Are they as “filling” or have as much protein? 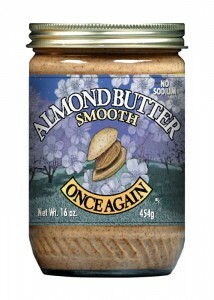 Also, what is a good protein replacement for nut butters? I like nut butters and love the idea of “bulking up” a piece of bread to make it more satisfying, but sometimes find it hard to digest nuts in large quantities. Is there something else I can put on my breads, muffins, etc. that will make me feel as full for as long as nut butters do? Nut milks offer different nutrient values than nut butters because they have have a much higher water content. If you make nut milk the traditional way (straining the liquid through a chinois and/or a nutmilk bag before consuming it), most of the “nut mush” (along with its fiber and protein) is caught and does not make it to your beverage. This helps explain why the average cup (1 serving) of commercial almond milk has 1 gram of protein, while 1 serving (2 tablespoons) of almond butter has 7 grams of protein. In terms of a good replacement for nut butters, you could always do a combination of nut butters with fruit. For example, if you normally put 2 tablespoons of nut butter on bread, try 1 tablespoon (or even 2 teaspoons) and then add some sliced bananas or mashed berries. The fiber in the fruit will help you feel full, while the decrease in fat will make the total snack easier to digest. You could also put a small amount of nut butter on bread and add a sprinkling of hemp, chia, or flax seeds for easier digestion. I’m seeing a nutritionist who has given me a regimen to follow. I’m a little skeptical of it, so am researching each of the items one by one. One of the items is forgoing milk. She said cow’s milk is particularly bad because it’s pumped full of antibiotics and hormones, and our stomachs aren’t meant to digest the milk of another animal. I know many people are lactose-intolerant because we aren’t meant to digest milk after childhood. However, if I’m not lactose-intolerant, is it still possible that milk is affecting my digestive system negatively? Do you ever recommend to your clients that they drop dairy entirely? Should I care that all of the substitutes for dairy milk (soy, almond, rice) are highly processed and don’t really occur in nature? First of all, not all cow’s milk is pumped full of antibiotics and hormones. While, sadly, that is the norm, it is possible to purchase organic milk from cows that have not been fed either of those two things. You can also purchase milk from grass-fed cows (that have also not been pumped with antibiotics and hormones) in most health food stores. As for the arguments that our stomachs aren’t meant to digest the milk of another animal — it depends. That is certainly true for some individuals, but not for others. For information on the digestibility of goat’s milk (it goes far beyond lower lactose levels! ), please read this post. Bottom line: if you are not lactose intolerant, there is no reason why dairy products would affect your digestive system negatively. I would never recommend that a client of mine who is able to digest dairy products completely eliminate them (I do think it is a good idea for omnivores to get calcium from a variety of different foods and not rely solely on dairy, though). Similarly, I would never tell a vegan client (or one who is lactose intolerant) that their diet is inferior because it does not include dairy. The mere presence — or absence — of dairy does not make a diet any healthier. From a purely nutritional standpoint, there is nothing wrong with having it or eschewing it. Ultimately, your body knows you best. There are people who, while not allergic or intolerant to dairy, feel better without it in their diet. Others feel better when they consume dairy on a daily basis. Both experiences are valid. In terms of dairy milk substitutes — I enjoy making different nut milks at home. It’s easy, inexpensive, and less processed than some products out there. That said, if you are buying unsweetened varieties that consist of two or three ingredients, you don’t have anything to worry about. FYI: One of my favorite home-made nut milks is cashew milk. In a blender, mix a half cup of cashews, two cups of water, a pinch of salt, and some vanilla extract. This makes two cups of cashew milk — delicious by itself or over cereal. For a chocolate version, add a tablespoon of cacao powder! You can also try substituting cashews with almonds, pecans, Brazil nuts, or hazelnuts.